Related Blog: Can Room Temperature Affect Your Quality of Sleep? Certain smells can create a physical change in your body. Lavender has been shown to lower your heart rate and decrease your blood pressure, therefore putting you in a more relaxed state. This body change can be helpful when it is used in your bedtime routine. If you can introduce ways of inviting the scent of lavender in your bedroom (sachets made of dried lavender, a diffuser that uses essential oils, or even using a lavender scented laundry detergent on your bedding) your body will respond to that scent and make you move into a good sleep mode. What scents help you go to sleep? With so many scent options out there, what are the best options to increase your ability to sleep? This list contains the top 4 scents for better sleep and the reasons why they work. This list also contains an option to personalize, based on your own individual experiences. Lavender - Discussed above, this calming fragrance has been used for ages to reduce anxiety and general agitation. The scent can slow down your nervous system which is what helps relax your body and prepare it for a good night's sleep. Using a lavender-infused massage oil can increase the effect by relaxing your muscles with a scent that naturally relaxes you. Vanilla - Vanilla has been shown to reduce the startle reflex in both animals and humans. It has been used within stress tests and the people that were given this scent have better blood pressure and more stable heart rates. This relaxing smell has become easily available in a wide variety of aromatherapy options; candles, oils, sachets, bath salts, creams, room mists and more. Jasmine - Possibly even more powerful for sleep than lavender, this flower's sweet smell really helps sleep quality. Sniffing this scent will decrease the amount of movement you have during a night's sleep. It also has been shown to have an improved quality of sleep, bringing you out of sleep in a more refreshed manner. Rose - The scent of a rose is both calming and sedative making it a perfect scent for inducing sleep. Studies have suggested that the scent of a rose can lead you to pleasant dreams. Other studies have shown that the smell of a rose, while you are sleeping, can improve your memory when you are awake. Your favorite scent - Possibly the best news of all, is that our olfactory system is linked to the part of our brain associated with emotions. So if there is a smell that has a big impact on you, or reminds you of relaxed, happy times, that could be the best scent for you to fall asleep to. The National Sleep Foundation has a very interesting write up on a Bedroom Poll that they did. 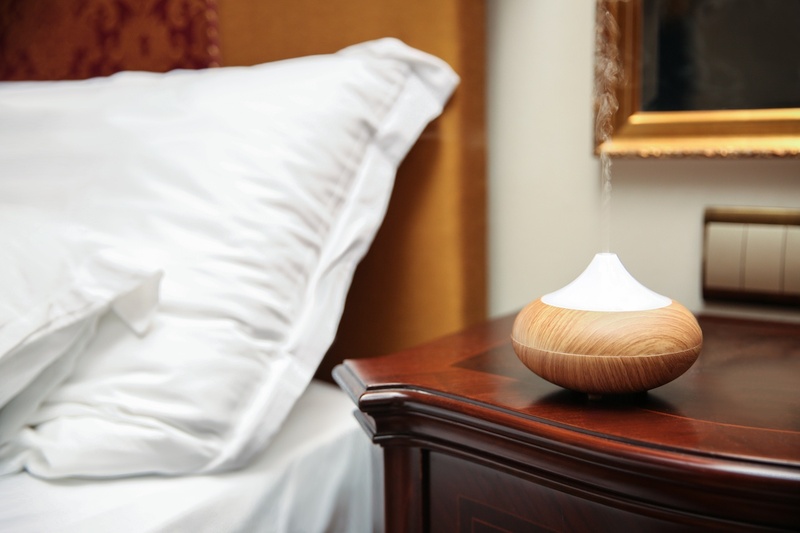 There was a pull out statistic from this report that spoke about air quality and said that "78% of Americans say that they are more excited to go to bed if their sheets have a fresh scent". So even if the idea of aromatherapy has you a bit skeptical about making a difference on your sleep, you can begin slowly with just making a choice on the scent of your laundry detergent when you are cleaning your bed linens. Try a couple of options that seem pleasant to you, and see if you can notice a difference in your own sleep patterns. There are so many options out there to help you make your bedroom the best possible sleeping environment; mattress, bedding, light, scent, sound, pillows, temperature, etc. Let us know what you are working on to make your ideal space.